« Lost In Myth: “Follow the Leader”—Can Changing One Moment Change Everything? Much like Jacob’s tapestry featured at the beginning of “The Incident,” Lost has woven a story filled with symbolism, mythology, and mystery. As Jacob says at the end of the two-part episode, “It takes a very long time when you’re making the thread. But I suppose that’s the point, isn’t it?” Well, I guess it’s the point when you have a moneymaking TV show and you need to keep audiences involved long enough to get to syndication and sell tons of merchandise. But most of the best stories I know are brilliant in their simplicity. This includes most nursery rhymes, tall tales, fables, and myths. Of course, you also have your Lord of the Rings and your Alice in Wonderlands, so there is hope for Lost to stand the test of time. Just like these other complex stories, Lost weaves together many themes that have helped to make it so meaningful. This is especially true in its final episode of the season. Once again, the main theme of the episode, the theme of the fifth season, and perhaps the theme of the entire show is that of fate versus freewill. Is life a constant, and “whatever happened, happened” or are we the variables, as Daniel Faraday came to believe, with the freedom to choose? Jacob seems to represent this freedom. He specifically reminds Hurley and Ben that they are free to choose their paths, bails young Kate out of her crime, doesn’t stop young James from writing his letter to Sawyer, tells the insecure Jack that sometimes things just need a little push, and gives his blessing to the tumultuous marriage of Jin and Sun. Does this make him good or evil? Based on his white shirt compared with his opponent’s black one, we are being led to believe that he is good. After all, he’s allowing the freedom to choose. But as with many of the characters of Lost, I don’t think that either of these two beings is good or bad. Like Ben and Widmore, they just have different beliefs—issues to be worked out, as Jacob said. These issues seem to set the seed level for every character in the hierarchy below them. Regardless of whether Jacob is on the side of good or evil though, I would say that he represents the guardian angel motif. This guardian angel can look out for us like Cinderella’s fairy godmother or the ghost of Obi-Wan Kenobi, or, it can be a troublemaker like the trickster fairy, Puck from A Midsummer Night’s Dream, whose mischief challenges us to become stronger. All throughout the flashbacks, we see how Jacob allows the Losties to choose their path, yet, he gives them little nudges along the way to help them stay on it—for better or worse. By bailing Kate out of her crime, did he teach her that she could get away with it, or encourage her to avoid it with her promise? By pulling Sayid aside, he saved his life, but allowed Nadia to be hit by a car. By telling the insecure Jack that sometimes things just need a little push, was he easing the argument he’d just had with his father, or setting up his tendency to always push things too far? Really, it’s up to the recipient of Jacob’s help to decide because he’s allowing them the freedom to live their life as they wish. He’s just occasionally intervening to guide them in the general direction of their destiny. This is actually in line with my own beliefs about fate and freewill. In my last column, I wondered if there’s, “a general path that life wants us to take, and when we drift, it nudges us back in the general direction we’re meant to go.” I later stated, “We have freedom of choice when it comes to the details. But ultimately, life will steer you [towards your destiny].” I went on to say that we just might get to see this message played out during the fifth season finale. We did. But not in the way I thought we would. I thought we’d get to see it through the incident itself. This may turn out to be the case for season six. In this episode however, we saw the theme play out through Jacob. 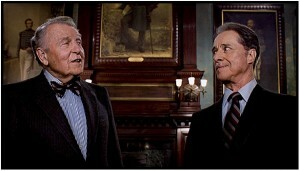 Watching this scene, I was reminded of the film Trading Places, where brothers Randolph and Mortimer Duke make a one-dollar bet over whether people are born bad, or if it’s a result of life circumstances. Using two unwitting characters (played by Dan Aykroyd and Eddie Murphy) as the pawns in their twisted game, the brothers manipulate the characters’ lives to see which of their theories is correct. Considering the opening scene of this episode, and all the times Lost has alluded to games, the insinuation seems to be that all the turmoil that has occurred on the island, and perhaps the world, is the result of a little game. A game played with human lives by two supernatural beings. Perhaps the reason the show is called Lost isn’t because the characters are physically lost or mentally lost, but because they are pawns in a game that will be won or lost with their lives. So who are the two players of this game? Since Jacob lives within the four-toed statue, it seems that we are meant to think that this is him. While the identity of this statue, finally revealed in this episode, will probably be debated for the next nine months, it definitely looked like it had the face of a crocodile. Along with its Egyptian garb and two ankhs, the statue is most likely, Sobek, the Egyptian god of fertility and repairer of evil that had been done. Since Jacob appears to be attempting to repair evil, this fits him well. We also know that eventually his statue will crumble and that this likely coincides with the time when women on the island can no longer conceive. From this perspective, Jacob would appear to be good since babies and those who repair evil are good things. Speaking of which, isn’t this Jack’s MO—his obsession with fixing things? Could he be related? Perhaps Jack, Christian, and Claire are offspring of Jacob, explaining why the latter two were able to live in Jacob’s cabin—assuming it ever actually was Jacob’s cabin and the people Locke saw inside actually were Claire and Christian. At the very least, Ilana, Bram, and Richard seem to think Jacob is good. What lies in the shadow of the statue? Some Latin phrase that apparently translates to, “He who shall protect (or save or watch over) us all.” But how do we even know that Richard and company are good? If they are all demons that are to be saved, that doesn’t speak well for Jacob. Even if they are good, Jacob lies in the shadow of the statue. Perhaps that phrasing is intentional. If there’s anything that Lost teaches us, it’s to never assume anything. 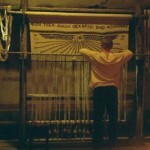 We do get at least one other clue though—Jacob’s tapestry. At the top is a quote from The Odyssey in Greek which translates to, “May the gods grant thee all that thy heart desires.” Surely, it is a benevolent god that would wish such things. Then again, doesn’t the realm of desire belong to Satan? Maybe I’m exaggerating a bit, but the point is, thanks to Lost’s many plot twists, we really can’t know anything for sure. But we can speculate, and that’s half the fun on this show. Maybe Lost is tricking us with the white-shirted Jacob and his black-shirted killer and Jacob is the one who’s evil. Sure his followers claim to be the good guys, but as Frank Lapidus pointed out, usually those who insist they’re the good guys, aren’t. Perhaps some insight can be gleaned by looking at Jacob’s opponent. Who exactly is this guy and how come Jacob didn’t mention his name? Well, if Jacob is Sobek, according to the popular vote on the Lost boards, that would make the other guy Seth—the Egyptian god of chaos and infertility. This would again explain the problem pregnancies assuming he comes to power after the statue crumbles. So, maybe Seth is actually the bad guy after all, or maybe they both are, or maybe it doesn’t even really matter. In fact, I’m not so sure that any of this will ever be spelled out for us, or if any of it is even relevant to the ultimate plot. Like Trading Places, Lost is about the pawns, not the players. The pawns are who we are meant to relate to. We may all be a part of God, but in this illusionary world we live in, we’re just the characters playing out the game of life. The best we can hope for is to win. Fate, freewill, gods, and games, and I’ve only just scratched the surface of the themes in this episode. At risk of turning this into a tome, I’ll just quickly reference two more. The first is one I haven’t really discussed much before and that is the theme of science versus spirituality. Besides fate and freewill, there is a sub-question that this episode seems to ask: Is it the experiments of DHARMA and the advancements of science that moves humanity forward, perhaps even saving us as Radzinsky claims? Or is it the work of supernatural guides like Jacob and our faith in God that saves us? 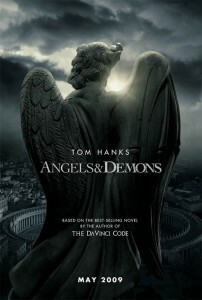 Yet another timely topic as this theme is explored in the book and film Angels and Demons that comes out this week. Specifically, the story asks whether science and spirituality are polar opposites, or, if they are in fact telling us the same thing. Just as with the yin and yang, fate and freewill, or Jack Shephard and John Locke, I believe each completes the other. This may, in fact, even be the lesson for Jacob and his killer. Neither of them is right or wrong. The final theme I’d like to bring up from this episode, is one I’ve covered quite a bit and pretty much makes up the bulk of my book. This is the theme of redemption. Are we brought into this world to overcome our issues? According to the mythology of Lost, the answer is, “yes.” This is how we win the game, or at least, get out of it. From the very beginning of the series, we’ve seen that all of the characters have major life issues. Through a series of challenges, the island helps them solve these issues, and once they do, they die. In this episode, it was Juliet’s turn to burn. Before arriving on the island, Juliet was timid, afraid to stand up for herself, and, as we learn from a flashback featured in this episode, confused about her parents’ divorce. Her parents tell her that just because two people love each other, doesn’t mean they should be together. Young Juliet doesn’t understand but her mother promises that one day she would. In “The Incident,” Juliet calls the shots on the sub, knocks out a crewmember which enables her escape with Sawyer and Kate, and then helps convince Sawyer and Kate to help Jack after all. She definitely solved her whole timid thing. Then she comes to terms with her relationship with Sawyer, realizing that love isn’t enough, fully conquering her remaining issue. And that’s when she died. Or at least, seems to have died. Again, you can never assume anything with this show. Still, looking at the arc of her character, her solved issues, and her red shirt, I think it’s a sure bet that in this timeline at least, Juliet is gone. For the most part, Lost seems to be sticking with the precedents it established early in season one. However, I do question the personification of freewill and fate in the forms of Jacob and his opponent respectively. Up until now, the writers have treated fans as though we are smart enough to pick up on these themes through metaphors such as time travel and through the choices of the show’s characters. To express them in the forms of ancient Egyptian gods seems to bring them closer to the realm of a fairytale. For me, this makes Lost’s storyline less relevant to today’s audiences. Most of us cannot relate to the myths of Egyptian gods as well as we can relate to the mythology of say, The Wizard of Oz, The Lord of the Rings or Star Wars. So why go there? The idea that fate is a result of the rigidity of our timeline or the programming of a video game—I totally get that. The idea that it is the result of one Egyptian god killing his brother who had the opposite view, not so much. If anything, it seems to be taking a step backwards. We already have tons of Egyptian, Greek, and Nordic myths that cover these themes. A good mythological story updates them so modern audiences can understand how they pertain to their lives. Even if Jacob isn’t a god, he’s still living in the statue of one, doesn’t age, creates hieroglyphics, and can resuscitate the dead. As fascinating as all this has been, I want to see Lost bring the story back to themes and characters I can relate to. I don’t care how fantastical the story becomes, as long as all the themes are consistent with one another. Egyptian god statues, Biblical names, creatures named after Greek mythology (i.e., Cerberus the smoke monster), time travel, ghosts, Buddhist concepts, book and movie references, and spiritual themes all seem to be a bit much. I know that all myths borrow elements from one another, but they don’t usually take a little bit from everything and jumble it together. For me, the only way Lost can successfully navigate its own convoluted myth and come to a satisfying conclusion is if there is something bigger going on. Something else beyond Jacob—a twist that puts everything in perspective. While it seems increasingly unlikely that the show is going there, I’ve still enjoyed the ride and have definitely learned a lot. Still, if I don’t get some major answers next season, I’m going to be disappointed. Many fans point to how many answers we got this season—about Rousseau, DHARMA, and how the Oceanic Six got back to the island. Great, but none of that really has to do with the mythology. Even the mythological answers we got just raised more questions. Locke was dead, then alive, now dead again—but what’s the story behind this doppelgänger of his? Ilana is working for Jacob. So, who is she exactly and why did she have bandages all over her face? Is she someone we’d recognize who’d gotten plastic surgery? 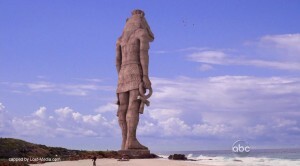 We see the statue is an Egyptian god, but who built it, why, how did it get destroyed, and why does Jacob have to stay there? Is he that god, if not, how does he have powers? There are still thousands of questions. I don’t expect Lost to answer them all, but I expect answers to the big ones, and I haven’t even mentioned the smoke monster, the numbers, Christian Shephard, Desmond’s time traveling, Walt’s powers, the food drops, the eyeball close-ups, everyone being connected, Kate’s horse, Hurley’s friend Dave, the pregnancy issues, the whispers, the polar bears, the Hurley bird, Libby, Mikhail’s revivals, the Black Rock, Henry Gale, the skeletons with the black and white stones in their pockets, and the basic origins of the island. To me, these are big questions and if they are not answered directly, I feel like I should be able to figure them out from the solution Lost leaves us with. So, getting back to my original question, what if Lost concludes without meeting our expectations? Has it all been worth it? In the immortal words of Aerosmith I’d like to remind everyone that “life’s a journey, not a destination.” We’ve learned so much on this journey—that we’re all connected, there are no accidents, and the universe gives us clues to help us on our paths. Even if you don’t believe any of these themes, the show contains real wisdom that can help us with our own life challenges—wisdom we’ve learned through the perspective of the characters and through the lessons of the episodes. No matter how Lost ends, I believe that if we listen out for the whispers, overcome the smokey monster of self-doubt, and use our connections, we will succeed on our journey through life. Even if the ending of Lost leaves us more lost than ever.